This is going to be an interesting review. I'll start out with some positives because I'm a positive guy. I just finished the book a couple days ago and I can't wait to read the next book. The way the book wrapped up was awesome and it made me yearning for the next book in The Stormlight Archive series. Everything else I've read by Brandon Sanderson, other than his YA titles, I've loved. He is one of my favorite authors. I love his podcast Writing Excuses. I met him in real life and he was funny, genuine and kind. I'm glad he's young so I'll be reading his books for a lifetime. Okay all of that said, I gave this book 3/5 stars because the first 75% of it bored me to death. Reading the first two acts of the story was like an uphill climb. When you're reading a 1,000+ page, or 47.5 hours of audio, book - that's a lot of reading of story you don't like. I didn't care about the characters until that last act of the book. It felt like almost every scene was just characters in a room talking. Hardly anything happened. I knew going into this book that it is the first in what is planned as a long series of books so I know he had a lot of stuff to set up - but that doesn't mean it has to be boring. I have many friends who were never bored reading this book and gave it 5 stars and raved about it to me. It bored me to tears and the only reason I kept reading it was that I have loved Sanderson's other work, and that people said it was worth reading. 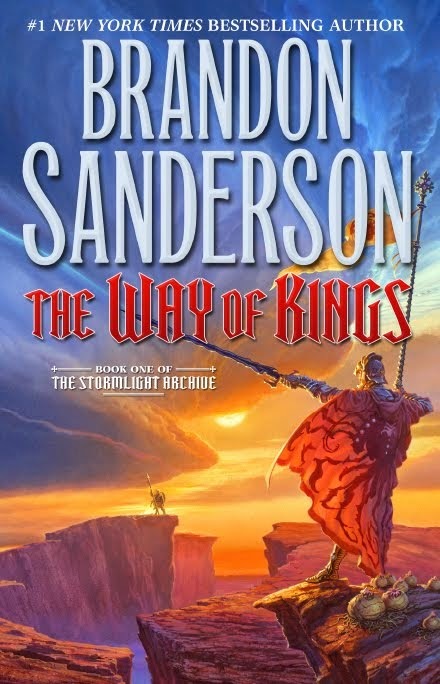 By the end of it I was totally on board, but until then I was switching to other books and then reading through The Way of Kings when I could stand it. Okay so now you know why I gave the book 3/5 stars, but let me end with this. The stuff at the end of the story is some of the coolest most epic stuff I have ever read. It was amazing! I loved every minute of it and couldn't wait for more. Now that I've finished the book I'm eagerly waiting for my Audible.com credit to come in for the month so I can download the next one and start listening. From an io9.com article I read I have really high hopes for the second one called Words of Radiance. Plus I'm now invested in what happens to the characters. I can't wait to read book two. I'm anticipating at least a 4/5 star rating for it. Have you read any of Brandon's books? Love them as much as I do? What about The Way of Kings? What was your reading experience with this book? I'd love to hear your thoughts in the comments. Thanks for stopping by!